In November 2010, Jesse and I played with short term tour ideas for at least several weeks. We wanted at least 2 days, preferably more, with the goals of exercising our touring gear, conditioning for next year, spending a night or two in the tent (we eventually abandoned that idea), and of course, enjoying the process. 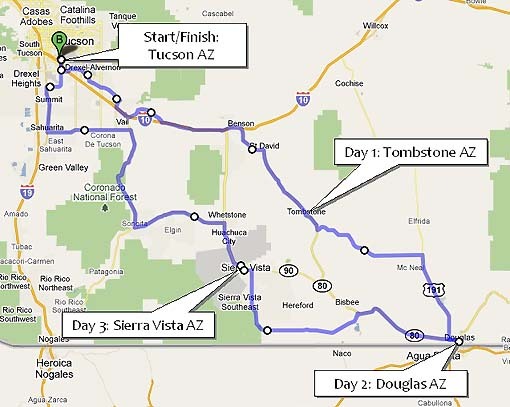 Seeking to stay out of winter temperatures, we began to look at southern Arizona and formulated this 4-day loop route from Tucson to Douglas and back. I’d never been as far south as Douglas in this region of Arizona, and so was really looking forward to it. We finalized the plans a few weeks in advance, and then had to wait for what seemed like a long time before actually taking off. Both of us were ready to go, but there is always the compromise of life’s events off the saddle, even when retired. We waited until the first weekend in December because I was fully occupied during Thanksgiving, and because Jesse’s wife was headed out of town that weekend.